Published on May 17, 2016 in Constructioneer, Daily Dirt and National. Closed Tags: asphalt, bridges, concrete, construction, construction industry, contractors, Federal Highway Administration (FHWA), Federal Highway Trust Fund, gas tax, heavy equipment, Highway Bill, highways, infrastructure, Interstate Highway System, jobs, pavement, roads, safety, the American Association of State Highway and Transportation Officials (AASHTO), The Bureau of Transportation Statistics (BTS), the Congressional Budget Office (CBO), the Maryland State Highway Administration (SHA), the National Highway Traffic Safety Administration (NHTSA), the Texas Transportation Institute (TTI), the U.S. Census Bureau, transportation, TRIP, unemployment. A new report recently released by TRIP assesses recent improvements undertaken to enhance mobility in Maryland, identifies the state’s top 30 traffic bottlenecks, and evaluates road and bridge conditions and highway safety. While a 2013 state transportation funding boost and the 2015 approval of a long-term federal surface transportation program have resulted in a significant increase in state transportation investment, Maryland still faces a significant challenge in improving mobility, conditions and safety, and supporting long-term economic growth. TRIP is a Washington, DC-based national transportation organization. The TRIP report, “Keeping Maryland Mobile: Progress and Challenges in Providing an Efficient, Safe and Well-Maintained Transportation System,” finds that throughout Maryland, state-maintained road conditions have improved since 2012 and the number of structurally deficient state-maintained bridges has decreased during that time. While traffic congestion continues to increase, the state has made progress in completing needed projects to improve the efficiency of its transportation system. Largely due to increased revenue as a result of the Transportation Infrastructure Investment Act of 2013, the average annual highway investment in Maryland by the State Highway Administration increased by 85 percent from an average of $810 million annually from 2010 to 2012 to an average of $1.5 billion annually from 2016 to 2018. As a result, the share of state-maintained roads and highways in Maryland in poor or mediocre condition decreased from 30 percent in 2012 (13 percent rated poor and 17 percent rated in mediocre condition) to 24 percent in 2014 (10 percent rated poor and 14 percent rated in mediocre condition). Similarly, the number of state-maintained bridges in Maryland rated structurally deficient was reduced from 97 in 2012 to 69 in 2015. Maryland has completed a number of congestion relief projects since 2013, including construction of the final section of the Intercounty Connector (ICC), construction of two toll-lanes on eight miles of I-95 from I-895 to MD 43, widening I-70 to six lanes at South Street/Monocacy Boulevard, widening several sections of US 40, and widening and reconstruction of I-695/Wilkens Avenue. Additional mobility improvements completed in Maryland since 2013 include expanded service patrols on major highways, enhanced driver information, improved traffic signal timing, and construction of 11 miles of new sidewalks and 13 miles of marked bicycle lanes. “From Governor Hogan’s $2 billion investment in highways and bridges to innovative projects and practical design, Maryland is committed to improving safety and reducing hours lost every day to congestion,” said Maryland Secretary of Transportation Pete K. Rahn. Despite efforts to improve the efficiency of Maryland’s transportation system, congestion on Maryland’s roads results in 195 million hours of delays annually and the consumption of 85 million additional gallons of fuel, resulting in an annual cost of $4.1 billion in lost time and wasted fuel. Two of the nation’s 25 most congested urban areas are located in or include parts of Maryland. The Washington, DC metro area, which includes suburbs in Maryland and Virginia, is ranked first nationally in the cost of traffic congestion per commuter, with congestion costing $1,834 per commuter and causing 82 hours of delay annually. The Baltimore urban area ranked 25th in the cost of traffic congestion per commuter at $1,115, with the average Baltimore motorist losing 47 hours annually. 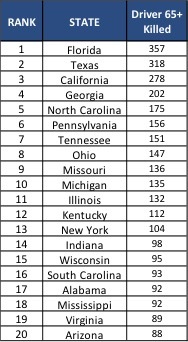 The TRIP report identifies Maryland’s top 30 bottleneck locations, with the top ten bottlenecks detailed below. 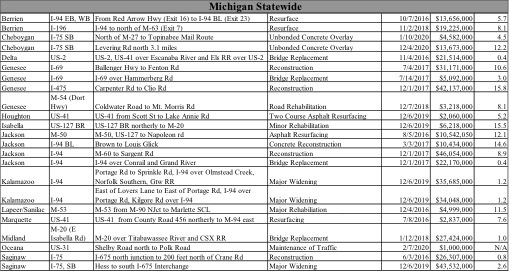 A full list of the top 30 bottlenecks throughout the state can be found in the report. Nearly a quarter of Maryland’s locally and state-maintained bridges show significant deterioration or do not meet modern design standards. Six percent of Maryland’s locally and state-maintained bridges are structurally deficient, meaning there is significant deterioration of the bridge deck, supports or other major components. Seventeen percent of locally and state-maintained bridges are functionally obsolete, meaning they no longer meet modern design standards, often because of narrow lanes, inadequate clearances or poor alignment. Traffic crashes in Maryland claimed the lives of 2,404 people between 2010 and 2014. Maryland’s overall traffic fatality rate of 0.78 fatalities per 100 million vehicle miles of travel is lower than the national average of 1.08. Maryland’s non-Interstate rural roads have a traffic fatality rate of 1.84 fatalities per 100 million vehicle miles of travel, approximately three times higher than the fatality rate of 0.61 on all other roads. The efficiency and condition of Maryland’s transportation system, particularly its highways, is critical to the health of the state’s economy. Annually, $445 billion in goods are shipped to and from sites in Maryland with 75 percent of the freight tonnage being shipped by trucks. Eight years after the nation suffered a significant economic downturn, Maryland’s economy continues to rebound. The rate of economic growth in Maryland, which will be greatly impacted by the reliability and condition of the state’s transportation system, continues to have a significant impact on quality of life in the Free State. With the state’s population and employment continuing to grow, Maryland must continue to improve its transportation system to foster economic growth and keep and attract business. In addition to economic growth, transportation improvements are needed to ensure safe, reliable mobility. Meeting Maryland’s need to further modernize its transportation system will require significant local, state and federal funding. Maryland has undertaken a sustained commitment to upgrade the condition and efficiency of its roads, highways, bridges, transit systems and pedestrian and bicycling facilities. The Maryland General Assembly’s approval of the Transportation Infrastructure Investment Act of 2013 has allowed the state to significantly boost its investment in Maryland’s transportation system. In December 2015 the president signed into law a long-term federal surface transportation program that includes modest funding increases and allows state and local governments to plan and finance projects with greater certainty through 2020. This significant boost in state transportation funding, as well as the modest increase in federal surface transportation funding, is supporting increased investment in road, highway and bridge repairs in Maryland and allowing the state to move forward with numerous projects to expand the capacity and/or efficient operations of its transportation system. This increase in transportation capacity and efficient operations will further economic development opportunities and improve quality of life. Population and economic growth have placed increased demands on Maryland’s major roads and highways, leading to mounting wear and tear on the transportation system. From 2000 to 2015, Maryland’s population increased by 13 percent, from approximately 5.3 million residents to approximately 6 million. Maryland’s population is projected to increase to approximately 6.9 million in 2040, with the state expected to add an additional 800,000 jobs between 2010 and 2040. Vehicle miles traveled (VMT) in Maryland increased 12 percent from 2000 to 2014 – from 50.1 billion VMT in 2000 to 56.4 billion VMT in 2014. Vehicle miles of travel in Maryland in 2015 were 2 percent higher than in 2014. From 2000 to 2014, Maryland’s gross state product (GSP), a measure of the state’s economic output, increased by 31 percent, when adjusted for inflation. Based on population and other lifestyle trends, TRIP estimates that travel on Maryland’s roads and highways will increase by another 20 percent by 2030. Traffic congestion places a significant burden on Marylanders, including lost time, reduced economic productivity and wasted fuel. Maryland’s roadways are among the most congested in the nation. Congestion on Maryland’s roads and highways results in 195 million hours of delay annually and the consumption of an extra 85 million gallons of fuel, resulting in an annual cost in lost time and wasted fuel of $4.1 billion. The share of Maryland’s freeways and expressways that experience heavy to severe congestion is increasing. In 2014, 16 percent of the state’s freeways and expressways experienced heavy to severe congestion during the morning peak commuting hours while 24 percent experienced heavy to severe congestion during the afternoon peak commuting hours. This is up from 16 and 22 percent, respectively, in 2013. Two of the nation’s 25 most congested urban areas are located in or include parts of Maryland. The Washington, DC metro area, which includes suburbs in Maryland and Virginia, is ranked first nationally in the cost of traffic congestion per commuter, with congestion costing $1,834 per commuter and causing 82 hours of delay annually. The Baltimore urban area ranked 25th in the cost of traffic congestion per commuter at $1,115, with the average Baltimore motorist losing 47 hours annually. 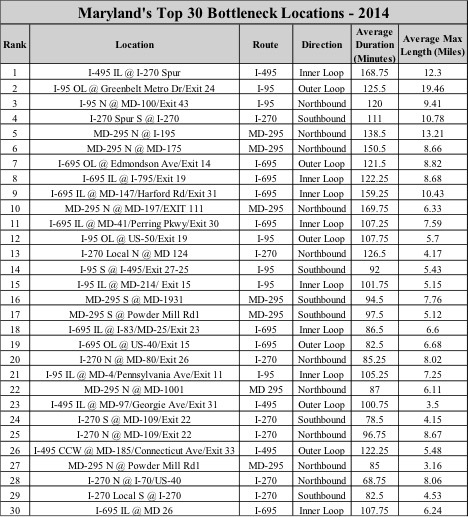 The Maryland State Highway Administration identified the top 30 traffic bottleneck locations in Maryland in 2014 by ranking segments of roadway based on the duration, intensity, frequency and average queue length of congestion. 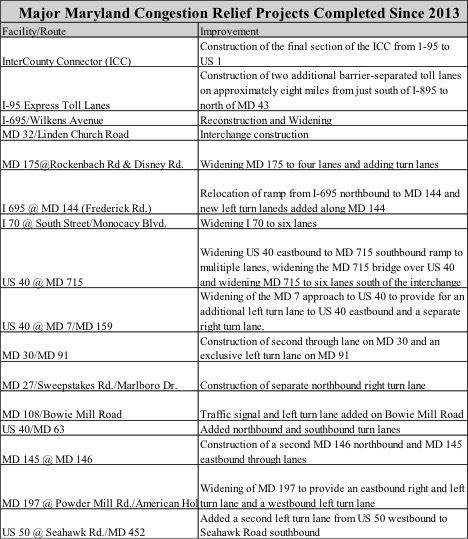 The following chart details the top 30 roadway bottlenecks in Maryland in 2014. Since the Maryland General Assembly’s passage of the Transportation Infrastructure Investment Act of 2013 the state has been able to increase investment in repairing roads, highways and bridges and move forward with numerous transportation projects to improve mobility in Maryland. Since passage of the Transportation Infrastructure Investment Act of 2013, the average annual highway investment in Maryland by the State Highway Administration increased by 85 percent from an average of $810 million annually from 2010 to 2012 to an average of $1.5 billion annually from 2016 to 2018. The share of state-maintained roads and highways in Maryland in poor or mediocre condition decreased from 30 percent in 2012 (13 percent rated poor and 17 percent rated in mediocre condition) to 24 percent in 2014 (10 percent rated poor and 14 percent rated in mediocre condition). The number of state-maintained bridges in Maryland rated structurally deficient has been reduced from 97 in 2012 to 69 in 2015. Since 2013, Maryland has been able to complete a number of highway projects to increase the capacity of many of the state’s most heavily traveled routes. 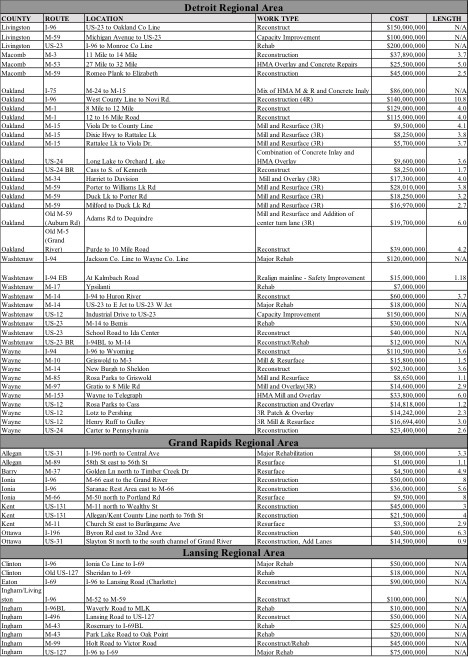 The following table provides information on some of the key congestion relief projects completed in Maryland since 2013. Expanding the state’s highway service patrols serving the Baltimore, Washington, Frederick and Annapolis areas to 24 hours a day seven days a week in 2014, which resulted in the patrols responding to 23,000 incidents and assisting nearly 37,000 stranded motorists in 2014. Improving driver information services, including upgrading the state’s 511 traveler information service and expanding the state’s travel time information, with nearly 100 message signs in operation throughout the state. Improving signal timing on 225 traffic signals. Installing 11 miles of new sidewalks and 13 miles of marked bicycle lanes. Nearly a quarter – 23 percent — of locally and state-maintained bridges in Maryland show significant deterioration or do not meet current design standards, often because of narrow lanes, inadequate clearances or poor alignment with the adjoining roadway. Six percent of Maryland’s locally and state-maintained bridges are structurally deficient. A bridge is structurally deficient if there is significant deterioration of the bridge deck, supports or other major components. Structurally deficient bridges are often posted for lower weight or closed to traffic, restricting or redirecting large vehicles, including commercial trucks and emergency services vehicles. A bridge is considered structurally deficient if: 1) any of its significant load carrying elements are found to be in a poor condition due to deterioration and/or damage; 2) it has a low weight restriction; or 3) the adequacy of the waterway opening provided by the bridge is determined to be extremely insufficient to the point that roadway flooding causes intolerable traffic interruptions. Seventeen percent of Maryland’s locally and state-maintained bridges are functionally obsolete. Bridges that are functionally obsolete no longer meet current highway design standards, often because of narrow lanes, inadequate clearances or poor alignment. Improving safety features on the state’s roads and highways would likely result in a decrease in traffic fatalities and serious crashes. Between 2010 and 2014, 2,404 people were killed in traffic crashes in Maryland, an average of 481 fatalities per year. Maryland’s overall traffic fatality rate of 0.78 fatalities per 100 million vehicle miles of travel in 2014 is lower than the national average of 1.08. The traffic fatality rate on Maryland’s non-Interstate rural roads in 2014 was approximately three times higher than on all other roads and highways in the state – 1.84 fatalities per 100 million vehicle miles of travel compared to 0.61, compared to a national average of 2.14 and 0.77, respectively. Several factors are associated with vehicle crashes that result in fatalities, including driver behavior, vehicle characteristics and roadway features. The efficiency of Maryland’s transportation system, particularly its highways, is critical to the state’s economy. Businesses are increasingly reliant on an efficient and reliable transportation system to move products and services. A key component in business efficiency and success is the level and ease of access to customers, markets, materials and workers. Annually, $445 billion in goods are shipped to and from sites in Maryland, with 75 percent of the freight tonnage being shipped by trucks. The report found that benefits of a transportation capacity expansion unfolded over several years and that the extent of the benefits were impacted by other factors including: the presence of complementary infrastructure such as water, sewer and telecommunications; local land use policy; the local economic and business climate; and whether the expanded capacity was integrated with other public investment and development efforts. 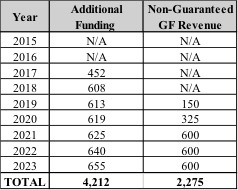 The recently approved five-year federal surface transportation program includes modest funding increases and provides states with greater funding certainty, but falls far short of providing the level of funding needed to meet the nation’s highway and transit needs. The bill does not include a long-term and sustainable revenue source. According to the 2015 AASHTO Transportation Bottom Line Report a significant boost in investment in the nation’s roads, highways, bridges and public transit systems is needed to improve their condition and to meet the nation’s transportation needs. AASHTO’s report found that annual investment in the nation’s roads, highways and bridges needs to increase 36 percent, from $88 billion to $120 billion, to improve conditions and meet the nation’s mobility needs, based on an annual one percent rate of vehicle travel growth. Investment in the nation’s public transit system needs to increase from $17 billion to $43 billion. AASHTO’s Bottom Line Report found that if the national rate of vehicle travel increased by 1.4 percent per year, the needed annual investment in the nation’s roads, highways and bridges would need to increase by 64 percent to $144 billion. If vehicle travel grows by 1.6 percent annually the needed annual investment in the nation’s roads, highways and bridges would need to increase by 77 percent to $156 billion. 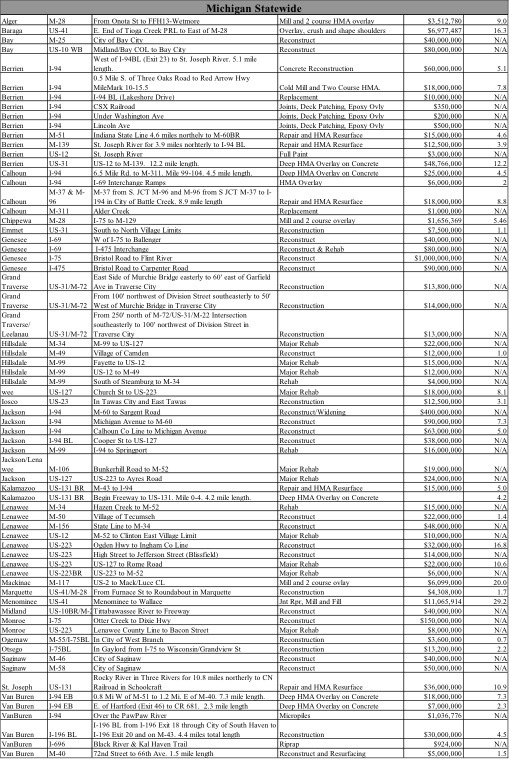 Sources of information for this report include the Federal Highway Administration (FHWA), the Maryland State Highway Administration (SHA), the Bureau of Transportation Statistics (BTS), the U. S. Census Bureau, the Congressional Budget Office (CBO), the Texas Transportation Institute (TTI), the American Association of State Highway and Transportation Officials (AASHTO),the National Highway Traffic Safety Administration (NHTSA). All data used in the report are the most recent available. Published on May 19, 2015 in Daily Dirt and National. Closed Tags: asphalt, Associated Builders and Contractors, bridges, concrete, construction industry, contractors, economy, employment, equipment, excavators, Federal Highway Trust Fund, gas tax, heavy equipment, high-speed rail, Highway Bill, highways, infrastructure, Interstate Highway System, jobs, pavement, roads, safety, the American Association of State Highway and Transportation Officials(AASHTO), the Council of State Governments (CSG), the Federal Highway Administration (FHWA), the National Cooperative Highway Research Program (NCHRP), the National Highway Traffic Safety Administration (NHTSA), the United States Department of Agriculture (USDA), transportation, TRIP, trucks, U.S. Census Bureau, unemployment. America’s rural transportation system is in need of repairs and modernization to support economic growth in the nation’s Heartland, which is a critical source of energy, food and fiber and home to an aging and increasingly diverse population that is heavily reliant on the quality of its transportation system. A new report released today by TRIP evaluates the safety and condition of the nation’s rural roads and bridges and finds that the nation’s rural transportation system is in need of improvements to address deficient roads and bridges, high crash rates, and inadequate connectivity and capacity. TRIP is a national non-profit transportation research group based in Washington, D.C. 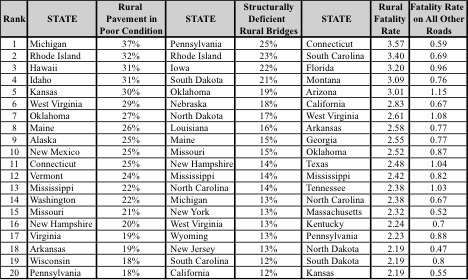 The chart below shows the states with the highest rate of rural pavements in poor condition, states with the highest share of structurally deficient rural bridges and those with the highest fatality rates on rural roads. America’s rural roads and bridges have significant deficiencies. In 2013, 15 percent of the nation’s major rural roads were rated in poor condition and another 39 percent were rated in mediocre or fair condition. In 2014, 11 percent of the nation’s rural bridges were rated as structurally deficient and 10 percent were functionally obsolete. The federal surface transportation program is a critical source of funding for rural roads. However, the current federal surface transportation program is set to expire on May 31, 2015. In addition to deteriorated roads and bridges, the TRIP report finds that traffic crashes and fatalities on rural roads are disproportionately high, occurring at a rate nearly three times higher than all other roads. In 2013, non-Interstate rural roads had a traffic fatality rate of 2.20 deaths for every 100 million vehicle miles of travel, compared to a fatality rate on all other roads of 0.75 deaths per 100 million vehicle miles of travel. Rural traffic fatality rates remain high, despite a substantial decrease in the number of overall fatalities. The quality of life in America’s small communities and rural areas and the health of the nation’s rural economy is highly reliant on the quality of the nation’s rural transportation system, particularly its roads, highways and bridges. America’s rural transportation system provides the first and last link in the supply chain from farm to market while supporting the tourism industry and enabling the growing production of energy, food and fiber. Rural Americans are more reliant on the quality of their transportation system than their urban counterparts. The TRIP report finds that the U.S. needs to adopt transportation policies that will improve rural transportation connectivity, safety and conditions to provide the nation’s small communities and rural areas with safe and efficient access to support quality of life and enhance economic productivity. To accomplish this, the report recommends modernizing and extending key routes to accommodate personal and commercial travel, implementing needed roadway safety improvements, improving public transit access to rural areas, and adequately funding the preservation and maintenance of rural transportation assets. America’s rural heartland plays a vital role as home to a significant share of the nation’s population, many of its natural resources, and popular tourist destinations. It is also the primary source of the energy, food and fiber that supports America’s economy and way of life. The strength of the nation’s rural economy is heavily reliant on the quality of the transportation system, particularly the roads and highways that link rural America with the rest of the U.S. and to markets in other countries. The economy of rural America rides on the quality and connectivity of the rural transportation system, which supports quality of life for the approximately 61 million Americans living in rural areas. Good transportation is essential to rural areas to provide access to jobs, to facilitate the movement of goods and people, to access opportunities for health care and educational skills, and to provide links to other social services. Transportation supports businesses and is a critical factor in a company’s decision to locate new business operations. For communities that rely on tourism and natural amenities to help support their economy, transportation is the key link between visitors and destinations. Roads, highways, rails and bridges in the nation’s heartland face a number of significant challenges: they lack adequate capacity, they fail to provide needed levels of connectivity to many communities, and they are not adequate to accommodate growing freight travel in many corridors. Rural roads and bridges have significant deficiencies, they lack many desirable safety features, and they experience fatal traffic crashes at a rate far higher than all other roads and highways. This report looks at the condition, use and safety of the nation’s rural transportation system, particularly its roads, highways and bridges, and identifies needed improvements. Rural areas in this report are based on the U.S. Census Bureau definition, which defines rural areas as regions outside of urban areas with a population of 2,500 or more. Road, bridge and safety data in this report is based on the Federal Highway Administration (FHWA) definition, which allows states to either use the U.S. Census Bureau definition to identify rural routes or to define rural areas as regions outside of urban areas with a population of 5,000 or more. The following are the key findings of the report. An aging and increasingly diverse rural America plays a vital role as home to a significant share of the nation’s population, natural resources and tourist destinations. It is also the primary source of the energy, food and fiber that drive the U.S. economy. Rural Americans are more reliant on the quality of their transportation system than their urban counterparts. While there are many ways to define rural, the U.S. Census Bureau defines rural areas as regions outside of urban areas with a population of 2,500 or more. According to the U.S. Census Bureau definition, 19 percent of the nation’s residents live in rural areas – approximately 61 million of the nation’s 314 million people in 2014. America’s rural population increased gradually each year from 1976 to 2010, rising between 0.1 and 1.5 percent each year. From 2010 to 2014, the nation’s rural population declined slightly as rural areas continued to be impacted by the Great Recession. While overall rural populations declined slightly between 2010 and 2014, population did increase in some rural areas from 2010 to 2014. This population increase occurred primarily in rural counties that have been impacted by the ongoing energy boom, particularly in the Northern Great Plains as well as portions of Arkansas, Louisiana, Pennsylvania and Texas. Many of the transportation challenges facing rural America are similar to those in urbanized areas. However, rural residents tend to be more heavily reliant on their limited transportation network – primarily rural roads and highways- than their counterparts in more urban areas. Residents of rural areas often must travel longer distances to access education, employment, retail locations, social opportunities and health services. The rural U.S. population is aging more rapidly than the nation as a whole. The share of older adults in rural areas is disproportionate, with 17.2 percent of those living in rural areas over age 65, while 12.8 percent of residents in urban areas and 13 percent of the nation’s total population are over 65. Rural areas are growing increasingly more diverse. Although racial and ethnic minorities make up only 21 percent of the rural population, minorities accounted for nearly 83 percent of rural population growth between 2000 and 2010. The movement of retiring baby boomers to rural America is likely to continue in the future as aging Americans seek out communities that offer affordable housing, small-town quality of life and desirable natural amenities, while often located within a short drive of larger metropolitan areas. Eighty-six percent of trips taken by Americans to visit rural areas are for leisure purposes. Popular tourism activities in rural America include hiking, golfing, biking, hunting, fishing and water sports. Rural areas are also home to beaches, national and state parks, wineries, orchards and other national amenities. The amount of rural tourism in a region is tied partly to the level of highway access. The quality of life in America’s small communities and rural areas and the health of the nation’s rural economy is highly reliant on the quality of the nation’s transportation system, particularly its roads, highways and bridges. America’s rural transportation system provides the first and last link in the supply chain from farm to market while supporting the tourism industry and enabling the production of energy, food and fiber. Freight mobility and efficiency is fundamental to rural economic vitality and prosperity. Economic growth and stability in rural areas is heavily reliant on the ability to move raw materials into, or the value-added products out of, these areas. The annual value of agricultural production in the U.S. increased by 33 percent from $297 billion in 2007 to $395 billion in 2012. While farming accounts for just six percent of all jobs in rural America, for every person employed in farming there are seven more jobs in agribusiness, including wholesale and retail trade, processing, marketing, production, and distribution. Despite pockets of rapid economic growth, many rural areas have experienced a slower recovery from the Great Recession. Rural employment remains three percent below its 2007 peak, while urban employment now exceeds pre-recession levels. Trucks provide the majority of transportation for agricultural products, accounting for 46 percent of total ton miles of travel compared to 36 percent by rail and 12 percent by barge. Trucks account for the vast majority of transportation for perishable agricultural items, carrying 91 percent of ton miles of all fruit, vegetables, livestock, meat, poultry and dairy products in the U.S. The rapid expansion of the energy extraction industry, particularly in the Great Plains states, has consumed rail capacity that had previously been used to move agricultural goods. As a result, the agricultural goods that had been shipped by rail are now being moved via alternate transportation means, placing additional stress on the rural highway system and increasing costs to farmers and consumers. Transportation is becoming an even more critical segment of the food distribution network. While food demand is concentrated mostly in urban areas, food distribution is the most dispersed segment of the economy. A highly competitive and efficient transportation system can lead to lower food costs for U.S. consumers and higher market prices for producers due to lower shipping costs, smaller margins and more competitive export prices. A report by the Pacific Economic Cooperation Council recommends that governments improve the quality of their transportation systems serving the movement of goods from rural to urban regions as a strategy to lower food costs and increase economic prosperity. A report on agricultural transportation by the USDA found it likely that market changes and shifts in consumer preferences would further increase the reliance on trucking to move U.S. agricultural products. The condition and quality of the nation’s highway system plays a critical role in providing access to America’s many tourist destinations, particularly its scenic parks and recreational areas, which are mostly located in rural areas. In 2013, travel and tourism related spending in the U.S. in 2013 totaled $1.5 trillion and 8.1 million Americans were employed in tourism-related jobs. America’s national parks, which are largely located in rural areas, received 274 million visitors in 2013, many in personal vehicles. Travel loads on America’s rural roads are increasing dramatically due to the booming energy extraction sector. This has been driven by increases in domestic oil and gas extraction, largely as a result of advancements in hydraulic fracturing (fracking), which has greatly increased the accessibility of shale oil and gas deposits, as well as the increased production of renewable energy such as wind and solar. Rapid growth in energy extraction has led to significant population and job growth in select rural areas, particularly in areas that were previously sparsely populated. Between 2001 and 2011, oil and gas extraction was a substantial contributor to 444 rural counties. In 114 of these rural counties, oil and gas extraction at least doubled from 2001 to 2011. Ethanol production in the U.S. increased from 1.7 billion gallons in 2000 to 13.3 billion gallons in 2012. Federal mandates require that production of renewable fuels, including biofuels and cellulosic fuels, reach 36 billion gallons per year by 2022. The U.S. production of liquid fuels, including crude oil and natural gas, has increased 34 percent from 2000 to 2014, increasing liquid fuel’s share of overall U.S. energy production, from 47 to 54 percent between 2000 and 2014 (includes coal and nuclear). The U.S. production of renewable energy, including wind and solar, has increased 48 percent from 2000 to 2014, increasing renewable energy’s share of overall U.S. energy production from 8.3 to 10.6 percent from 2000 to 2014 (includes coal and nuclear). The development of significant new oil and gas fields in numerous areas, particularly in the North Central Plains, and increased agricultural production, are placing significantly increased traffic loads by large trucks on non-Interstate rural roads, which often have not been constructed to carry such high load volumes. The average travel per-lane mile by large trucks on major, non-Interstate arterial rural roads in the U.S. increased by 13 percent from 2000 to 2013. The potential for additional economic growth in many rural areas is being impeded by the failure to significantly modernize the nation’s rural transportation system and provide for adequate connectivity. This lack of connectivity is preventing economic growth and reducing quality of life for rural residents. Sixty-six cities of 50,000 or more in the U.S. do not have direct access to the Interstate Highway System. 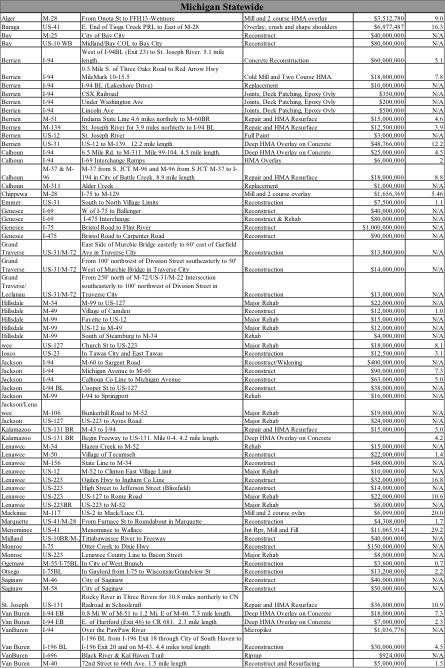 A list of the 66 cities can be found in Appendix A. Rural transportation accessibility and connectivity is critical to transportation-dependent business sectors including the growing energy production sector, advanced manufacturing and tourism. Many jobs located in urban areas also depend on economic inputs from rural communities. 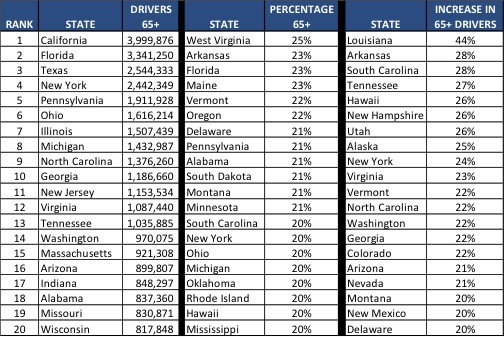 Since the routes for the Interstate Highway System were designated in 1956, the nation’s population has nearly doubled from – 165 million to 318 million. The abandonment of more than 100,000 miles of rail lines in recent decades, mostly in rural areas, has reduced access in many rural communities and increased reliance on trucking for freight movement. A report by the American Association of State Highway and Transportation Officials (AASHTO) found that connectivity is particularly poor in rural portions of Western states because of the significant distance between Interstate highway routes and the lack of adequate rail service. Only 60 percent of rural counties nationwide have public transportation available and 28 percent of those have very limited service. Residents of rural areas often must travel longer distances to access education, employment, retail locations, social opportunities, and health services. Rural residents also assume additional risks as a result of living in areas that may be farther from police, fire or emergency medical services. 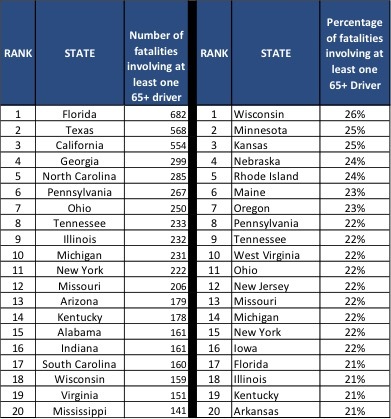 Traffic fatalities on the nation’s rural roads occur at a rate nearly three times higher than all other roads. A disproportionate share of fatalities take place on rural roads compared to the amount of traffic they carry. Rural roads have a traffic fatality rate that is nearly three times higher than all other roads. In 2013, non-Interstate rural roads had a traffic fatality rate of 2.20 deaths for every 100 million vehicle miles of travel, compared to a fatality rate on all other roads of 0.75 deaths per 100 million vehicle miles of travel. Crashes on the nation’s rural, non-Interstate routes resulted in 15,601 fatalities in 2013, accounting for nearly half – 48 percent – of the nation’s 32,719 traffic deaths in 2013. Rural, non-Interstate routes accounted for 24 percent of all vehicle miles of travel in the U.S. in 2013. While overall fatality rates have decreased in recent years, the fatality rate on rural, non-Interstate roads has declined at a slower rate. From 2005 to 2013, the fatality rate on rural, non-Interstate routes declined by 16 percent, from 2.61 fatalities per 100 million vehicle miles of travel in 2005 to 2.20 in 2013. The fatality rate on all other roads decreased 29 percent from 2005 to 2013, from 1.05 fatalities per 100 million vehicle miles of travel to 0.75. After years of steadily decreasing, the rate of fatalities and the number of fatalities on rural non-Interstate roads increased in 2012 before dropping slightly in 2013. 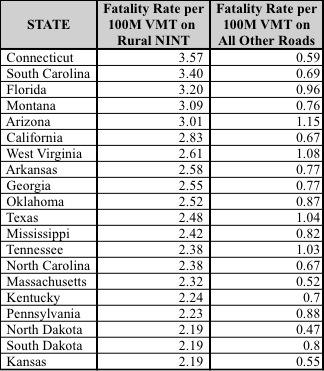 The rate of traffic fatalities on the nation’s rural non-Interstate roads decreased from 2.61 traffic fatalities per 100 million vehicle miles of travel in 2005 to 2.14 in 2011 before increasing to 2.21 in 2012 and 2.20 in 2013. Similarly the number of traffic fatalities on the nation’s rural non-Interstate roads decreased from 20,333 in 2005 to 15,668 in 2011 before increasing to 16,161 in 2012 and dropping to 15,601 in 2013. 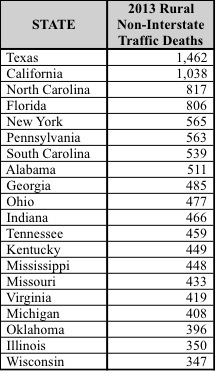 The chart below details the twenty states that led the nation in the number of rural non-Interstate traffic deaths in 2013. Data for all states is available in Appendix B. 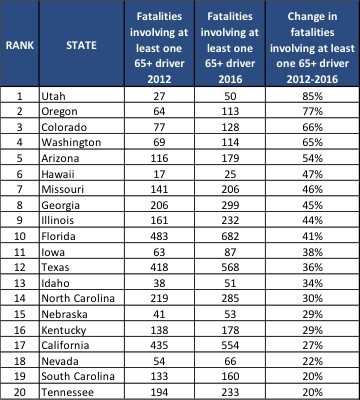 The chart below details the twenty states with the highest rate of rural non-Interstate traffic fatalities per 100 million miles of travel and the fatality rate per 100 million vehicle miles of travel on all other roads in the state in 2013. Data for all states is available in Appendix C.
The higher traffic fatality rate found on rural, non-Interstate routes is a result of multiple factors, including the following: a lack of desirable roadway safety features, longer emergency vehicle response times and the higher speeds traveled on rural roads compared to urban roads. Rural roads are more likely than urban roads to have roadway features that reduce safety, including narrow lanes, limited shoulders, sharp curves, exposed hazards, pavement drop-offs, steep slopes and limited clear zones along roadsides. Because many rural routes have been constructed over a period of years, they often have inconsistent design features for such things as lane widths, curves, shoulders and clearance zones along roadsides. Rural roads are more likely than urban roads to be two-lane routes. Eighty-six percent of the nation’s urban non-freeway arterial roads have two-lanes, compared to 56 percent of rural non-freeway arterial routes having two-lanes. Rural roads are more likely than urban roads to have narrow lanes. A desirable lane width for collector and arterial roadways is at least 11 feet. However, 23 percent of rural collector and arterial roads have lane widths of 10 feet or less, compared to 18 percent of urban collector and arterial roads with lane widths of 10 feet or less. Most head-on crashes on rural, non-Interstate roads are likely caused by a motorist making an unintentional maneuver as a result of driver fatigue, being distracted or driving too fast in a curve. While driver behavior is a significant factor in traffic crash rates, both safety belt usage and impaired driving rates are similar in their involvement rate as a factor in urban and rural traffic crashes. Numerous roadway safety improvements can be made to reduce serious crashes and traffic fatalities. These improvements are designed largely to keep vehicles from leaving the correct lane and to reduce the consequences of a vehicle leaving the roadway. The type of safety design improvements that are appropriate for a section of rural road will depend partly on the amount of funding available and the nature of the safety problem on that section of road. Low-cost safety improvements include installing rumble strips along the centerline and sides of roads, improving signage and pavement/lane markings including higher levels of retroreflectivity, installing lighting, removing or shielding roadside obstacles, using chevrons and post-mounted delineators to indicate roadway alignment along curves, adding skid resistant surfaces at curves and upgrading or adding guardrails. Moderate-cost improvements include adding turn lanes at intersections, resurfacing pavements and adding median barriers. Moderate to high-cost improvements include improving roadway alignment, reducing the angle of curves, widening lanes, adding or paving shoulders, adding intermittent passing lanes or adding a third or fourth lane. Systemic installation of cost effective safety solutions and devices in rural areas helps to improve safety not just by targeting individual safety problem points on a road, but also making entire segments safer by improving those roadway segments that exhibit the characteristics that typically result in fatal or serious-injury crashes. The nation’s rural roads, highways and bridges have significant deficiencies. Fifteen percent of the nation’s rural roads have pavements in poor condition, and more than one-fifth of the nation’s rural bridges need rehabilitation, repair or replacement. In 2013, 15 percent of the nation’s major rural roads (arterials and collectors) were rated in poor condition and another 39 percent were rated in mediocre or fair condition. 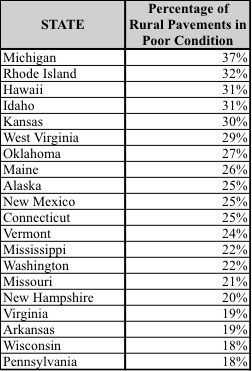 The chart below shows the twenty states with the greatest percentage of major rural roads in poor condition in 2013. Rural pavement conditions for all states can be found in Appendix D.
In 2014, 11 percent of the nation’s rural bridges were rated as structurally deficient. A bridge is structurally deficient if there is significant deterioration of the bridge deck, supports or other major components. Structurally deficient bridges are often posted for lower weight or closed to traffic, restricting or redirecting large vehicles, including commercial trucks, school buses and emergency services vehicles. In 2014, 10 percent of the nation’s rural bridges were rated as functionally obsolete. 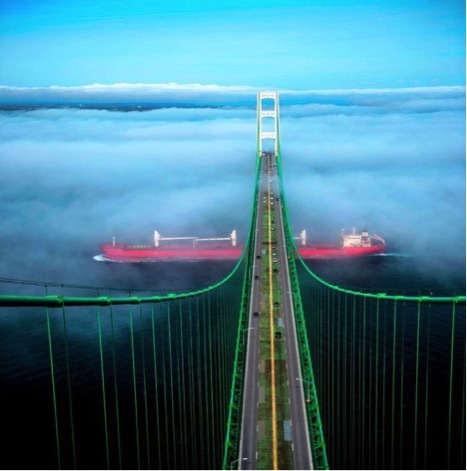 Bridges that are functionally obsolete no longer meet current highway design standards, often because of narrow lanes, inadequate clearances or poor alignment. 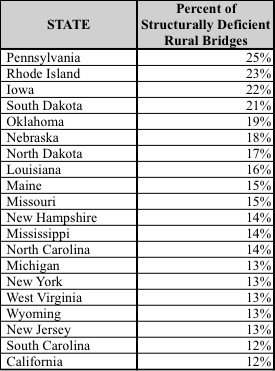 The chart below shows the twenty states with the highest share of rural bridges rated structurally deficient in 2014. Rural bridge conditions for all states can be found in Appendix E.
America must adopt transportation policies that improve rural transportation connectivity, safety and conditions to provide the nation’s small communities and rural areas with a level of safe and efficient access that will support quality of life and enhance economic productivity. The following recommendations by TRIP for an improved rural transportation system are also based partially on findings and recommendations made by AASHTO, the National Highway Cooperative Research Program (NCHRP), the Council of State Governments (CSG) and the Ports-to-Plains Alliance. 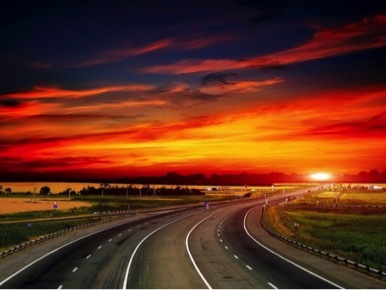 Widen and extend key highway routes, including Interstates, to increase connectivity to smaller and emerging communities to facilitate access to jobs, education and healthcare, while improving access for agriculture, energy, manufacturing, forestry, tourism and other critical segments of the rural economy. The NCHRP report found that the construction of an additional 30,000 lane miles of limited access highways, largely along existing corridors, is needed to address the nation’s need for increased rural connectivity. Modernize major two-lane roads and highways so they can accommodate increased personal and commercial travel. Improve public transit service in rural America to provide improved mobility for people without access to private vehicles. Adequately fund needed rural roadway safety improvements and provide enhanced enforcement, education and improved emergency response to reduce the rate of rural traffic fatalities. Implement cost-effective roadway safety improvements, including rumble strips, shoulder improvements, lane widening, curve reductions, skid resistant surfaces at curves, passing lanes, intersection improvements and improved signage, pavement markings and lighting, guardrails and barriers, and improved shielding of obstacles. Adequately fund local and state transportation programs to insure sufficient preservation of rural roads, highways and bridges to maintain transportation service and accommodate large truck travel, which is needed to support the rural economy. The federal government is a critical source of funding for rural roads, highways and bridges. 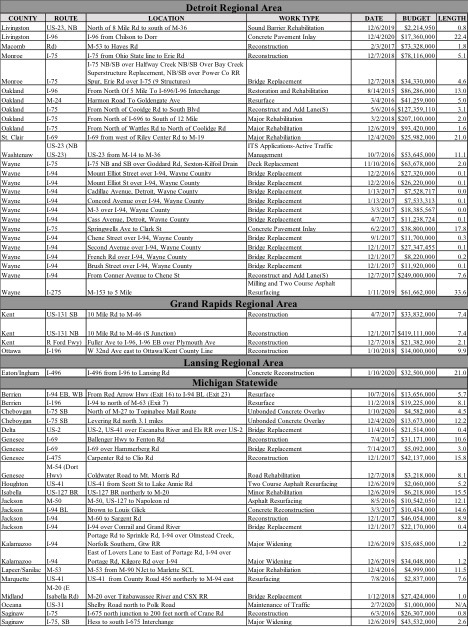 However, current federal transportation funding will expire on May 31, 2015. If Congress decides to provide additional revenues into the federal Highway Trust Fund in tandem with authorizing a new federal surface transportation program, a number of technically feasible revenue options have been identified by AASHTO. A significant boost in investment on the nation’s roads, highways, bridges and public transit systems is needed to improve their condition and to meet the nation’s transportation needs, concluded a new report from AASHTO. All data used in this report is the most current available. Sources of information for this report include: The Federal Highway Administration (FHWA), the National Highway Traffic Safety Administration (NHTSA), the National Cooperative Highway Research Program (NCHRP), the American Association of State Highway and Transportation Officials(AASHTO), the United States Department of Agriculture (USDA), the Council of State Governments (CSG) and the U.S. Census Bureau.